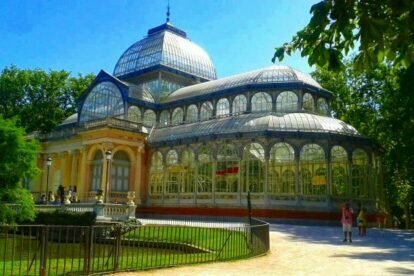 We are not talking about a fairy tale, but about a real glass palace located in the heart of the park most adored by the locals as well as the non-locals of Madrid. This place deserves your visit and your time: here you can see exhibitions and first class art installations. The Crystal Palace is part of the art circuit of the Reina Sofia National Museum. Although originally conceived as a greenhouse for tropical plants, it is now a place with open doors for art. It was built by Ricardo Velázquez Bosco inspired by the Crystal Palace in London. So it is very possible that this place reminds you of a British corner. This structure, built in 1887, is like a guardian of the green heart of the city. Personally, I recommend going in the mornings on weekdays — it’s a paradise, and this way you can enjoy it without queuing up to enter. It looks beautiful in any situation, and it will become one of the most photographed buildings in your stay in Madrid. I never get tired of seeing it.